Gert Knebel is a well known German comedian, mostly for his work with Badesalz, one of the pioneers of German comedy. But also his bands Flatsch and Angst vor Clowns never took things too seriously. 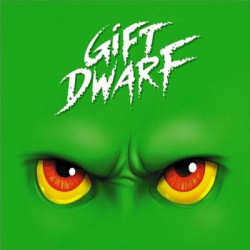 GiftDwarf is his first venture though into the metal world, with support from the two Grave Digger and Rebellion musicians Uwe Lulis and Gerd Lücking. The quintet is completed by his long-time musical companion Olaf Mill and Natalie Eis. GiftDwarf is a brand new band that was only founded in 2010 and that presents Gert Knebel in a way you have never heard him before. His typical sense of humour is obviously still present, as the record’s garishly green artwork already reveals. You’ll get brutal guitar riffs and pounding drums aplenty, but mandolins, harps and horn sections prove that GiftDwarf are totally able to look over the rim of their tea cup. The music is located most of the time between hard and heavy rock and reminds of classic bands like AC/DC and Motörhead. My Mother Looks Like Lemmy is even a tribute to the heavy metal legend. GiftDwarf also don’t hide their German roots, with parallels to Helloween and Gammy Ray popping up occasionally. Gert Knebel doesn’t take the English language too seriously and procures an exaggerated dialect that adds to the high fun factor which sets the band apart from traditional metal bands. British citizen Gerladine Blecker helped with the lyrics in order to even add some typical British humour. You can watch a splendid video clip of their track Fritz which shows up with some crossover elements that add even more variety to the band’s sound. GiftDwarf have managed to come up with an ambitious album where not only the music is up to par, but also the humorous component is absolutely satisfying. Their self-titled debut is a sure remedy against every lame party.